Can you design your own refrigeration system? Take the guess work out of your designs. This program will find the balance point between compressor, evaporator and condenser. In addition, it will show you the process on the refrigerant ln(P)-h diagram and do a step-by-step simulation of the coil performance. If you are a manufacturer or contractor who builds systems, then you will find this program essential. It is easy to specify the system components and the design conditions. Press the [solve] button and you have the exact duty. No guessing or assumptions needed. The solution is clearly based on the design conditions so by using the RefSim program, you can calculate the actual solution at design and part-load conditions. To do this manually, you will need to plot the condensing unit curve for different ambient temperatures. Next, superimpose the evaporator performance curve. The intersection between the two is the balance point. This process is quite a mission and explains why its not often done commercially. If you want to see the step by step process in detail, see Stoecker & Jones 'Refrigeration and Air Conditioning'. We have adopted the numerical approach which is clearly better suited to modern computer techniques. 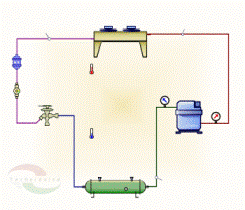 There are three main components ( Compressor, Evaporator and Condenser). All you need to do is solve the simultaneous equations for the two unknowns, evaporating temperature and condensing temperature. One of the features of this program is that it shares information with other programs. There are two coils in an air cooled system. These coils can be found in our CoilSim library. The compressor can be selected from a compressor selection expert. In this form you can enter the evaporating and condensing temperatures and browse through the database. As you do this, the duty of the compressor is calculated at specified conditions. How's that for a time saver? I remember manually hunting through my various catalogs for a suitable compressor. The problem with the paper catalog is that you have to manually interpolate to find the duty. 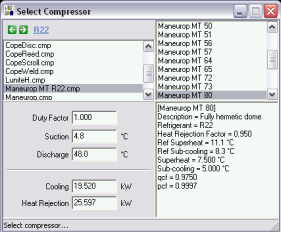 This compressor selector takes proper account of the superheat and the sub-cooling of the selected compressor since the reference conditions are stored in the compressor database. If you would like me to add a specific compressor to the database, send me an email  or post a message to the guestbook of this web site. Once you have a system balance, all that remains is to select line sizes and the TX Valve or the capillary tube. The program has a build in refrigerant line size calculator. Just click on the refrigerant line on the schematic and the line size dialog will appear. 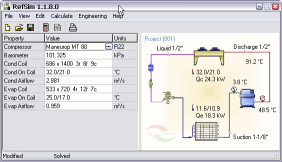 Chiller simulation program using the RefSim framework. RefSim is actually more than it appears to be on the surface. I am using a programming technique called polymorphism, where the program can take on different roles depending on the components. This fits in very well with the refrigeration cycle that is created with abstract heat exchanger definitions. By delaying the definition of the heat exchangers until runtime, it is possible for the program to take on different roles. The one shown above is a conventional air-cooled package air-conditioner. Now consider changing the evaporator to a shell & tube heat-exchanger and we have an air-cooled chiller. Since the cycle solve methods are independant of the heat-exchangers, this allows the development of any type of cycle, simply by applying a specific heat-exchanger model. In a similar way, we define a water-cooled chiller and an evap-condenser cooled chiller. The heat pump can be found commercially from any number of manufacturers. Actually the cycle is identical to the refrigeration cycle, the definition is simply which heat exchanger is the required energy control. So, if the need is for heating, you would want the air cooled condenser coil indoors. In other words, you would reject heat into the room. Clearly, it is not possible to swap the evaporator and condenser when you want heating, but by installing a simple reversing valve, the roles of the existing heat-exchangers can be reversed. The design problem is therefore to make an indoor coil that works as an evaporator during the cooling season and a condenser in the heating season. In the RefSim program, we include a reverse cycle function that swaps the coil dimensions around so that you can test the design at different conditions. In technical article 1, we have used the RefSim program to illustrate how it is possible to size the outdoor coil to ensure that you get no freezing. if you have any ideas, requests or would like to contribute a technical article.